After swapping links with Greg Brock, he kindly offered to take me caving in a well-known cave called Swildon’s Hole in Priddy, Somerset. I jumped at the chance of trying a more exciting cave and so on a fairly brisk February morning we met in the car park by the village green in Priddy. I had done a bit of caving previously, but I knew this caving in Swildons Hole was going to be nothing like anything I had experienced before. For a start it had a river running into the mouth of the cave! But Greg has been caving here for many years so I felt I was in safe hands. Across the road from the car park is an old barn where you can change into your caving gear – pretty handy on those colder days. After changing into a very fetching yellow suit, helmet and grabbing a light, all of which were supplied by Greg, we headed up the road to pay our £1 fee to gain access to the farmer’s land. After a quick trek across a couple of fields we came across the entrance. It really was in the middle of nowhere. Just a small stone building surrounding the tiny hole. This was it, we were going down into an underground river! It took my eyes a few moments to adjust to the darkness as we entered the hole, but I soon started noticing the amazing formations. Almost at once we were entering mind blowing caverns full of stalactites and stalagmites. This really was like no other cave I had been down before. We were soon wading through the river and down deeper into the cave. There was one part where we had to take a leap of faith from a cascade into water below. Not really knowing how deep it was and jumping into the darkness really got the adrenaline pumping! Greg seemed to know every corner of the cave and filled me in on all of the intriguing names which various parts of the cave have been given; Barnes loop, Watergate, Priddy green sink and many more. He also talked about the cave diving they had been doing in the far reaches of the cave – which I am definitely going to leave to him! Eventually we came across sump 1. Umm…. I wasn’t really expecting a sump! A sump is a short section where the only way forwards is to dive underwater. Greg went through first and I anxiously waited for my signal to follow. A rope leading to the other side of the sump was permanently fixed there to aid in pulling yourself under, and my signal was to be a tug on this. Suddenly I felt Greg tug on the rope from the other side, so I psyched myself up, took a deep breath and went for it. Pulling myself along by a rope underwater not quite knowing when I would surface was a little worrying. Luckily it wasn’t very far and I was soon swimming around on the other side. From here we went as far as sump 2. From then on you need diving gear to explore the caves, so for today we had gone as far as we could. We now had the task of getting back up the river, which was just as much fun. There was plenty of climbing ladders & cascades, scrambling and swimming to be done, as well as diving under the sump a second time on our way back. We also took a detour so see a few more amazing underground formations. 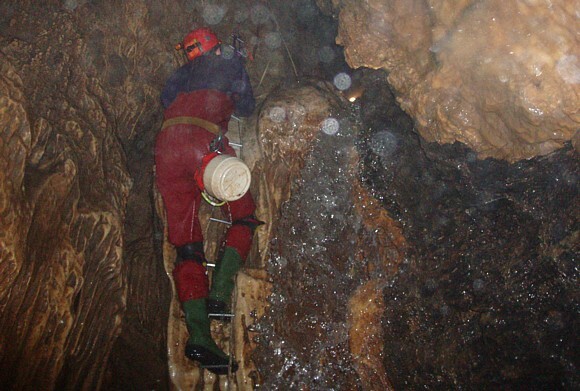 By the time we had reached the surface again I have to admit I was shattered, but also hooked on Caving! Greg had given me a great tour of Swildon’s Hole and had really fuelled my urge to do more Caving in the future. This is a cave that you need to see with your own eyes. If you would like to find out more about what Greg has been up to, including more great underground shots check out his web site.